The purpose of the Hutchinson County Historical Museum is to collect, preserve, and to interpret the heritage of Hutchinson County, with particular emphasis on the oil field and boomtown story of the 1920-1930 era, for public benefit. 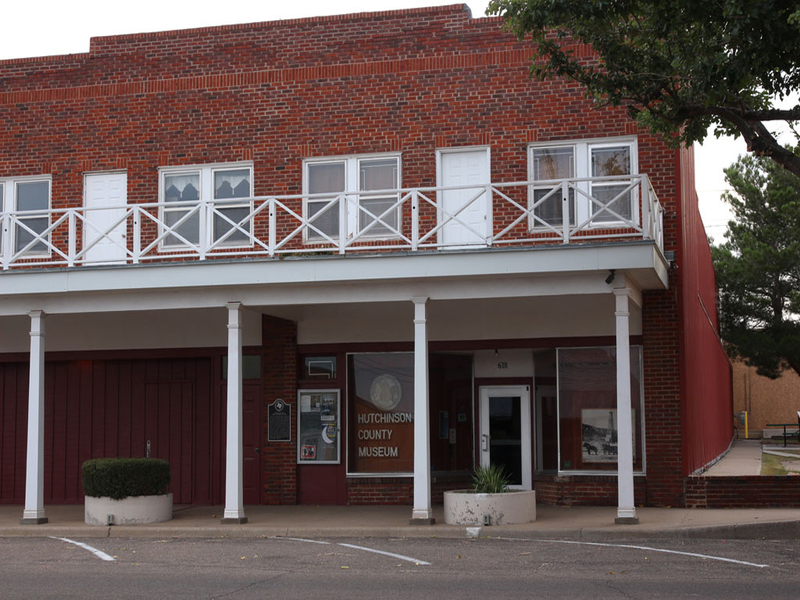 The Hutchinson County Historical Museum collects, preserves, and exhibits principally those artifacts, publications, archival materials, photographs, ephemera, and other items that are relevant to the settlement, and early historical development of the county. Tuesday - Friday 9:00 a.m. to 5:00 p.m. • Saturday 1:00 to 4:30 p.m. The River Valley Pioneer Museum is located on HWY 60/83 in downtown Canadian, Texas and was established in 1986 by a group of ambitious volunteers. Stop by to see our many permanent exhibits which offer historic interpretation of the settlement period in the eastern Texas Panhandle. We have permanent exhibits as well as rotating exhibits from a variety of collections. As you stroll around the museum, you will see archeology, geology, paleontology, rodeo and ranching exhibits. We host several traveling exhibits per year, as well as events and fundraisers including our popular Ladies Hat Luncheon, Mother/Daughter Luncheon and our Gala and Silent Auction. Our annual Quilt Show is held during our Canadian’s Fall Foliage Weekend, the third weekend in October. Be sure to join us for our reunion & barbecue held during our July 4th Celebration. Come by and experience our history–it’s alive and kicking! Explore more than 500 million years of history across a 26,000 square mile expanse of the Panhandle-Plains – all under one roof. Welcome to the Panhandle-Plains Historical Museum. Discover one of the premier museums of the nation. You will find the heart of Texas art, the free spirit of the Taos and Santa Fe schools, and the unsurpassed Southwest American Indian art. Unlock the hidden world of the ancient past through our paleontology, geology and archeology areas while learning about the rich history of the region and seeing some of the finest examples of American fashion in the Textiles Gallery. Our exhibits are changing constantly, and there is always something new to see. From dinosaurs to modern art, from saddles to automobiles, we have it all.Be sure to bookmark our calendar of events and sign up for our email notifications to receive updates about programs and events. Be a part of it all and join us today! Accessibility: All museum areas are wheelchair and handicap accessible. Wheelchairs and strollers are available at no charge on a first-come, first-served basis. The Armstrong County Museum seeks to collect and preserve the sights and sounds of yesteryears and today, that have had an impact on the culture of Armstrong County and the Panhandle of Texas. This is accomplished in the museum with displays that tell the story of the area, in the Art Gallery with works of area artists and in the Gem Theatre with dramatic and musical productions. In short, the goal is to provide a major cultural and tourist attraction that makes a difference for the county, the Panhandle Area and the State. Join us for the "The Annual Museum Banquet." This year we are featuring "Young Country" musical entertainers and promotion of "The Musical Drama, Texas." Contact us for details. The XIT Museum offers a taste of the pioneer West through historical and period exhibits, farming and ranching displays, and extensive photographic documentation of bi-county history. The museum partners with local schools and art teachers to offer a visiting artist program. The newest exhibit at the museum will feature wildlife that are native to the area, some that are rare; the exhibit will also include hands-on learning activities. The Carson County Square House Museum, opened in 1967, has been recognized as one of Texas’ best small rural museums since its dedication. Comprised of 14 buildings and macro artifacts, the Museum tells the history of Carson County and the surrounding area through its interpretive exhibits. Using the Square House, replica dugout, windmill, ATSF caboose, the commercial exhibit, the 1912 Conway Church and the many permanent exhibits and dioramas, the Museum changes exhibits in the three galleries to tell the stories of the people who have lived in this region since archaic times. A favorite location of school and organizational tours, the Square House hosts dinners prepared by Board members serving on the luncheon committee. Seven traveling exhibition trunks are taken into area schools and presented by the Educator. Local and area artists vie for the opportunity to show their work at the Square House. There is always something interesting to see here! Located in Memorial Park in Pampa, Texas, Freedom Museum USA is open Tuesday through Saturday from Noon until 4:00 p.m. Special tours may be arranged by appointment. The Museum collection is located in an old water pumping station originally built by the WPA in 1939. In August 1986, Pampa Army Airfield Reunion, later in conjunction with Veterans of Foreign Wars Post 1657, began development of a museum to commemorate and honor those brave men and women who sacrificed so much that we might be free. Freedom Museum officially opened in August 1994. Remodeled and enlarged, Freedom Museum is currently staffed by volunteers and all contributions, which are tax-deductible, are directed fully to the development and maintenance of the facility. All branches of the United States Armed Forces are represented in the Freedom Museum. Exhibits of both official and private memorabilia from military and civilian sources offer a well-rounded view of American military history. After completion of the latest addition, the Museum currently contains approximately 3600 square feet to house an amazing selection of exhibits. Thank you for visiting us in Pampa, Texas. The White Deer Land museum is located on the main street at 112 S. Cuyler. We are located in the two-story restored office building of the White Deer Land Company. The Land Company built this building in 1916, and the corporation was dissolved in 1957. The building has the original tin ceilings, tile floors, and much of the furniture used by the Land Company officers. This museum is one of the few left in the Texas Panhandle that has guided tours, because most of the artifacts are in the open and in a room-like setting. It is situated just as the co-founder of the museum wanted it to be; a friendly, homey atmosphere. There are two floors filled with wonderful, well-cared for, furnishings and period clothing. It’s a great place to spend an afternoon where you can step back in time. The Woody Guthrie Center is dedicated to celebrating Woody's life and legacy and educating a new generation about his important role in American history. Woody’s songs celebrate the beauty and bounty of America and seek the truth about our country and its people. He turned complex ideas about democracy, human rights, and economic equality into simple songs that all Americans could embrace. Woody spoke for those who carried a heavy burden or had come upon hard times. His words gave a voice to their struggle, and his songs gave them hope and strength. The Woody Guthrie Center, home to the Woody Guthrie Archives, preserves his legacy and life story and communicates the social, political, and cultural values found in his vast body of work. The Center is a repository for Woody’s writings, art, and songs and an educational resource for teachers and students everywhere. The Woody Guthrie Center is more than a museum; instead, it is a center of investigation for inspiration. By providing examples of Woody’s ability to use his creativity as a way of expressing the world around him, we hope to encourage others to find their voices and the power that lies within the creative process. Welcome to Comanchero Canyons Museum, dedicated to telling and preserving the history of the 19th-century commerce between the settlements of New Mexico and the Indian Nations of the Southern Plains. Open Saturdays from 10 am to 4 pm, and at other times by special request if we can find a volunteer (which we usually do). The Comanchero Canyons Museum is located at 200 South 3rd Street, Quitaque, Texas. The Comanchero Canyons Museum is a 501(c)(3) Texas nonprofit corporation organized to research and display artifacts and replicas depicting the history of the canyons and land surrounding them located in Briscoe, Floyd, Hall, Motley and Swisher counties prior to the 20th century. This authentic carreta (cart) donated to the museum by Marisue Potts of Motley County, in memory of her husband, Ralph Powell, is on permanent display in the Comanchero Museum at Quitaque, Texas. A primary objective of this effort is to educate the young people raised in this area about the richness of its past. Hopefully they will become good stewards, recognizing the necessity for preserving and promoting the beauty and natural resources unique to this area. That is what attracted the occupation of this particular place, beginning with prehistoric animals and culminating with the occupation by sheep and cattle raisers in the late 19th century.